One cannolo, Two cannoli. 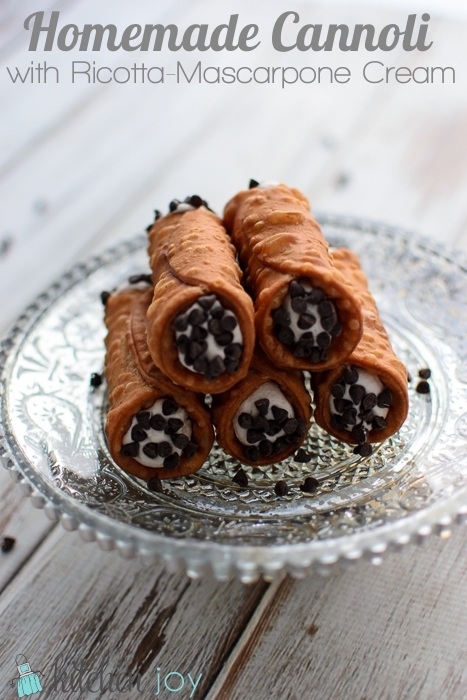 Why do we always refer to these treats as cannoli, and never a cannolo? Because it is impossible to eat only one of them. 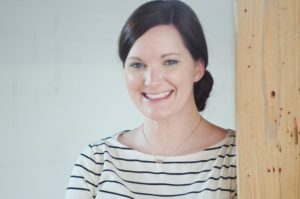 I just love these “little tubes” (See how you’re learning some Italian with me?). When I lived in Italy, I tried cannoli at basically every pastry shop I came across. 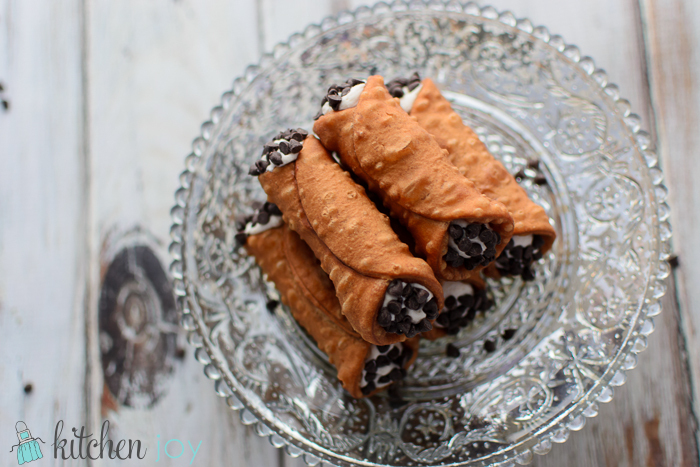 These homemade Cannoli with Ricotta-Mascarpone Cream are still my favorite. 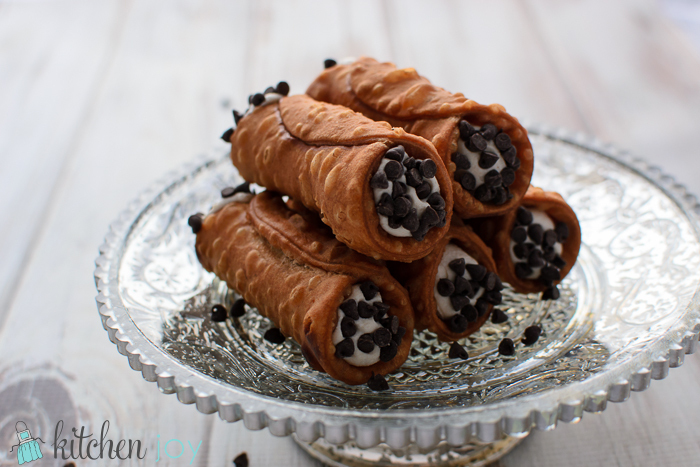 First thing first, if you want to make Cannoli with Ricotta-Mascarpone Cream at home you will need some cannoli forms like the ones pictured below. 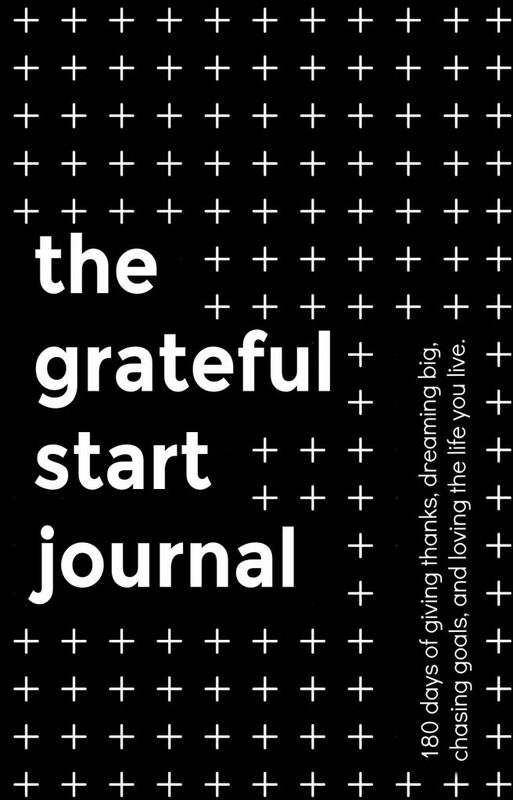 They’re available on Amazon for a reasonable price, and if you’re anything like me, you’ll put them to good use. Last, but not least, the filling. This recipe for the filling is delicious without being overly sweet or so rich that you can’t possibly have another. Some filling recipes are made with ricotta, others are sometimes made with mascarpone, and some are simply filled with a custard (less common). I found my favorite version to include equal parts of ricotta and mascarpone. Using both ricotta and mascarpone make the filling lighter and less dense than the super-rich mascarpone versions, but is still wonderfully creamy and decadent. First thing my dad said when he heard I was making cannoli: “Leave the gun, take the cannoli.” -The Godfather. Couldn’t have said it better myself. Divide dough in half, leaving one half wrapped in the plastic. Roll out dough on a lightly floured surface until it is very thin, about the thickness of a penny. Using a round cutter, or the rim of a container about 3 1/2 inches in diameter (I used the rim of a plastic container), cut out circles. Repeat with remaining half of the dough. Pour a few inches of oil in a large, heavy-bottomed saucepan or pot. Heat over medium heat until a thermometer registers 375 degrees, regulating heat to maintain temperature around 375-380 degrees F.
Wrap each circle of dough around a cannoli form, and seal with the egg white (just a little dab will work like glue). Leave the dough on the form. You'll remove the shell from the form after frying. 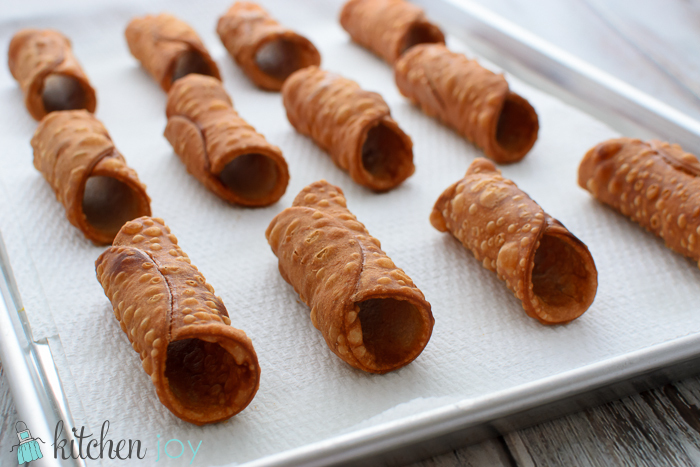 In batches of 2 at a time, fry each cannoli shell until golden, about 1 minute. Carefully remove the shells from the oil using a skewer inserted through the metal tube, or using tongs. Allow to drain and cool on paper towel for a few minutes before sliding the metal cannoli mold out from the shell. Repeat with remaining dough. Beat ricotta, mascarpone, confectioners sugar, vanilla, cinnamon, and salt together until smooth. Fold in mini chocolate chips. Cover and refrigerate at least 1 hour. Using a piping bag with an opening cut about the same diameter as your cannoli shells, fill the cannoli. 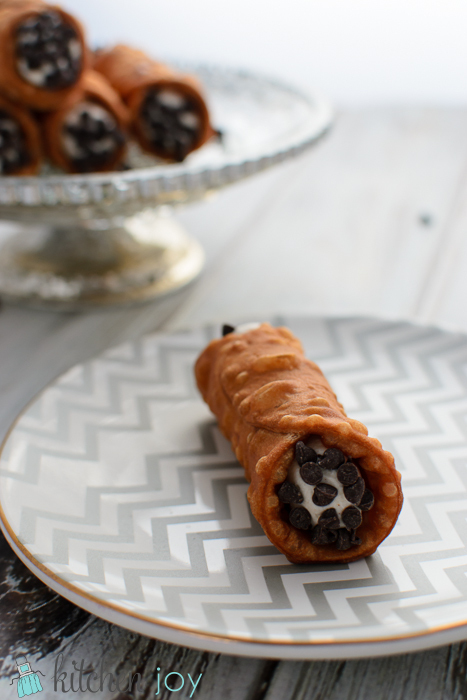 Roll each end of the filled cannoli into the remaining mini chocolate chips. Note: Do not fill the cannoli shells ahead of time. The shells will get soft and chewy. You can make the shells and the cream ahead, and then fill them shortly before serving. 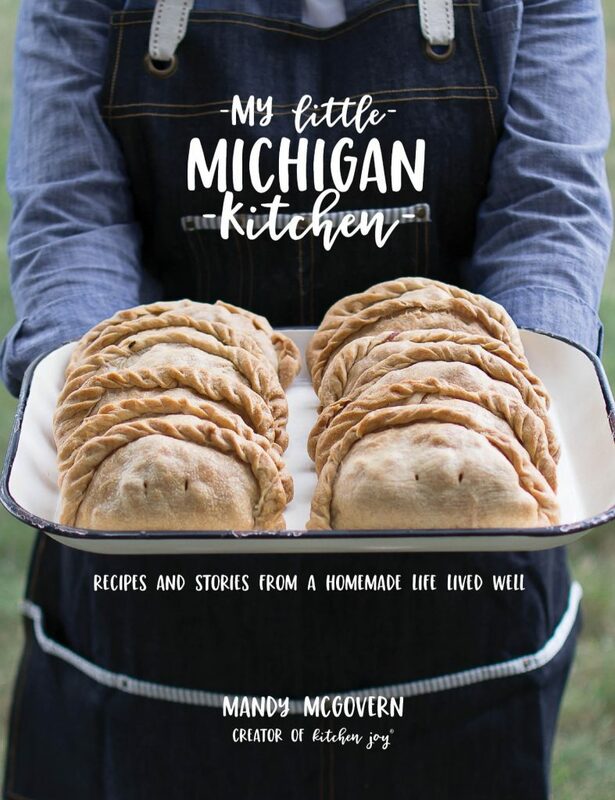 This recipe first appeared on Kitchen Joy.